In case you missed my last post about living in Ecuador, check it out here for background information. During my six months living in this gorgeous country, I traveled quite a bit. I took advantage of the incredibly cheap bus system and journeyed through many of the mountain towns of Ecuador. There are many small towns and really neat little communities that deserve a visit, whether you are an expat or a tourist in Ecuador. Located just outside of Otavalo, which is about 2 hours north of Quito, Cotacachi is an adorable little town offering some of the finest handmade leather products in the region. Fast becoming a major expat haven as well, Cotacachi offers tourists and expats alike a quaint escape into the stunning mountains. The nearby city of Ibarra is where most people head for urban amenities, whereas Cotacachi harkens back to simpler, quieter times. If you’re looking for a tranquil retirement spot, this may be what you need. If you’re looking for quality handmade leather and an adorable town to meander through, look no further than Cotacachi. A quick trip from Quito, Mindo offers some fun outdoor activities and a beautiful setting. Go tubing down the easy rapids and hike through the mountain trails; visit the butterfly farm and enjoy a fresh fruit smoothie as you swing your day away surrounded by pristine nature. Zipline across canyons and don’t forget to check out the chocolate factory! Spend the day hiking along the ridge if you’re brave, or simply head down into the crater lake to paddle around on a kayak for a while, taking in the unbelievable views and the intense colors of the water around you. Yep, you’ll also find thermal baths here because of – you guessed it! – the nearby volcanic activity. If you’re lucky you’ll get to witness the volcano spewing some lava, just don’t be unlucky enough to have it ruin your trip. The sweetheart of all expat information, Cuenca deserves its fame as a colonial city filled with culture and cuisine, offering a unique blend of people in a charming little city. The old city center is also a UNESCO World Heritage site. Walk the cobblestone streets, venture out to the nearby national parks, and enjoy the convenience of location for day trips in any direction toward sea or mountains. Cajas National Park is just outside the city and offers interesting hiking trails. Ingapirca is an ancient ruins site of the Cañari people, which is a quick trip from Cuenca and well worth a short visit. One of my all-time favorite spots I’ve ever visited! 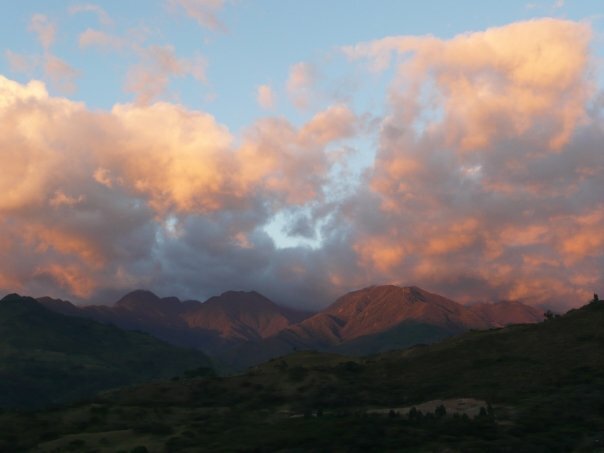 Vilcabamba simply stuns. I stayed outside of town on the hillside overlooking the valley where the village sits. I can honestly say, those views of the Andes will never get old – unlike the people of this area, which is known as the Valley of Longevity. Ecuador offers such variety within its rather small territory. If you are heading there for a visit, take into account how much time you have. Bus rides can take hours to travel short distances because of the nature of the mountain roads. And rushing through town after town just to check them off the list won’t be enjoyable at all. I spent six months slowly and carefully traveling all around Ecuador – so don’t think you can see everything I did within only a week or two! Slow travel is always best in my opinion, so if you only have a week to check out an entire country, just know you will merely scratch the surface. You better plan on a return trip soon! Want to learn more? Check out my lifelong love affair with Ecuador plus the places I visited coming down from the Andes. Be sure to connect with me on Facebook for more updates and other fun things that might not make it to the blog. I’m also on Twitter, Instagram, and Pinterest so let’s be friends there, too!